Year in and year out, we find ourselves waiting to see if the Groundhog will see its shadow on February 2nd, we begin to enjoy more daylight, and we start to get antsy for summer to just get here already so we can get out on the green. Whether you’re a player, a host, representative of a business, or a sponsor, you need to have your game face on and come equipped. We’re here to get you everything you need, no matter how high or low your handicap. Golf lovers are fiercely dedicated to their sport. It takes focus, determination, time and money to be a serious player. For these folks, participating in golf outings and/or tournaments is a frequent event. As a businessperson, a round of golf provides the opportunity to bond, network and strengthen relationships with new or long-term clients and/or with industry peers and competitors. Golfers tend to need things: accessories, apparel, clubs and tools. 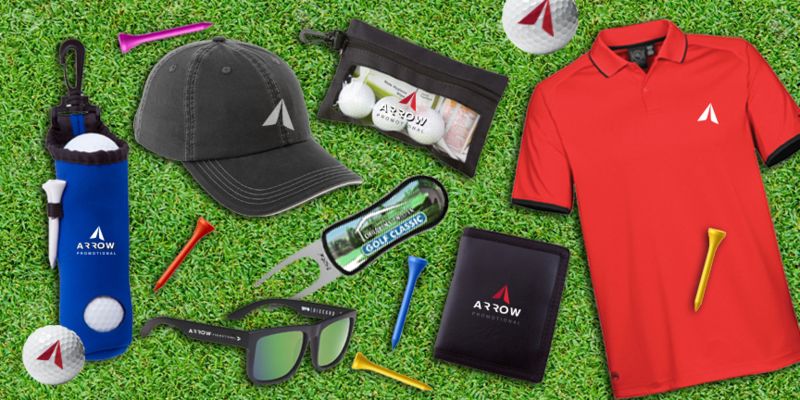 If you’re an outing/tournament host, you’ll want to give these people gifts and swag that represent your organization in the most professional and lasting way. If you’re playing a casual game with a client, handing them a great leather bag tag or a high-end divot tool is a great way to start or end the day. Because of golf’s popularity, there is a huge range of items available as giveaways. These include great apparel, bags, tournament awards, tees and tools, brushes, and on and on. We’ll expand on the what below. Who are these great for? The list includes but is not limited to golf/country clubs, event planners, companies planning outings for clients or employees, charities and many, many others. If you’re a business, think about sponsoring an event or offer to include some product swag in a charity golf outing goodie bag as a promotion for your company. You want those that wind up with your branded products to see that you take your business seriously. Handing out golf giveaways is a great way to increase your brand awareness, and these items have longevity, too. Gift recipients will take your item to future outings, ensuring that your brand is on their mind for years to come. Here at Arrow Promotional, we’ll find you high-quality, long-lasting products that will impress the recipients. Tell us your price range, your timeline and give us a rough (pun intended!) idea of what you’re looking for, and we’ll find something that fits you to a T(ee).